1. Preheat the oven to 200°C, gas mark 6. Line a large baking sheet with baking parchment and unroll the puff pastry sheet onto it. Score a 2cm-wide border around the edge of the pastry with a sharp knife, taking care not to cut all the way through. Prick the pastry inside the border all over with a fork to prevent it puffing up too much in the oven. 2. 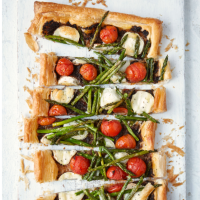 Spread the black olive tapenade over the pastry, then arrange the tomatoes, goats’ cheese slices and asparagus over the top. Season and bake in the centre of the oven for 25-30 minutes, until the pastry is crisp and golden. Slice and serve with a green salad, if liked. This recipe was first published in Thu Apr 26 11:44:05 BST 2018.